Hello everyone! 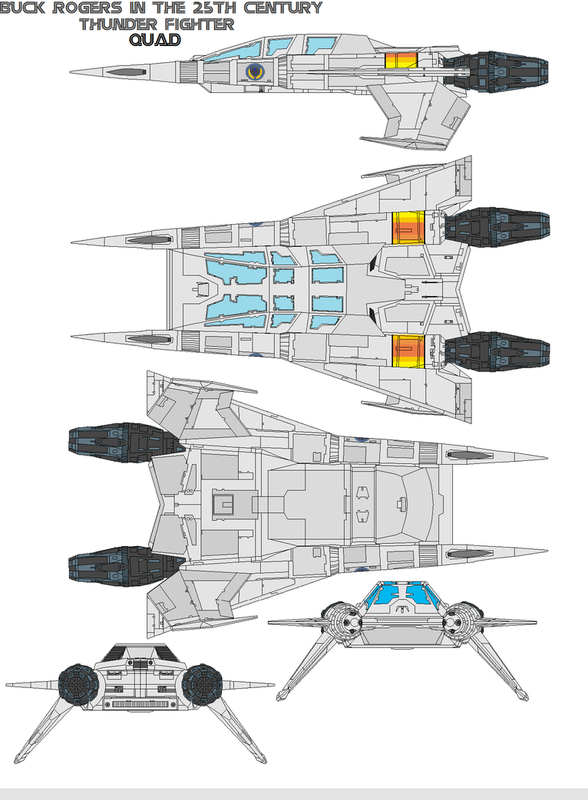 Here's a variation of a Buck Rogers starship - the Quad Fighter. The mini popsicle stick Quad Fighter shares a lot of the build steps with the Thunderfighter instructable posted last July 18, 2013. The main differences between the Thunderfighter and the Quad are the canopy and fuselage. The Quad's canopy is obviously much wider (to accomodate four passengers) compared with the single (or tandem?) canopy for the Thunderfighter. As with the previous post, this build would not be possible without the computer generated imageries (cgi) uploaded by Gerard Duffy aka Taranis. There are more images in his site at http://taraniscgi.wordpress.com/. I can't wait for a more detailed rendering of the Millenium Falcon. This one's for you Taranis! In my Thunderfighter instructable last year, I needed to sandwich two (2) layers of thick coffee stirrers, grind and shape it to form the weapons/engine pylon assembly. As with the X-wing post, wooden dowels saved me the burden of sandwiching and shaping the twin boom assemblies. In addition to the wooden dowels, regular sized-popsicle sticks, thin wooden coffee stirrers and toothpicks were used for this build. Most of the smaller parts were from my "spares box" including loose items to hold assemblies in place during completion of the build. Keywords used in google and bing image searches were "buck rogers quad fighter". The schematics were from deviantart's bagera3005 and as mentioned earlier, from Gerard Duffy's cgi images. The CGIs were used as reference for the various views and details of the Quad. Thanks again for the pictures guys! This is also the first instructable to include my plans (to scale) that I used as a pattern for the build. All fabricated parts are scaled based on the published plans. The base airframe was made from three (3) layers of regular popsicle sticks. The laminated layers were shaped into a wedge by using a drum sander attachment in a Dremel 3000 moto tool. The Quad's cockpit canopy was made from two (2) layers of sandwiched regular sized-popsicle sticks. Unlike the Thunderfighter's coffin-shaped canopy, the Quad's was rectangular and angled using a disc sander attachment on a moto tool. The rear top part of the airframe was from a single layer of regular-sized popsicle stick shaped using an olfa cutter and a cutting wheel attachment on a moto tool. This piece was glued to the rear end of the base airframe first. The Quad's cockpit canopy was glued to the airframe next. The bottom rear part of the airframe was also from a single layer of regular-sized popsicle stick from my spares box. A cutting wheel attachment was used to carve a notch to fit the ventral cockpit housing. The bottom rear part was glued to the ventral side of the base airframe and finished using a disc sander attachment on a MiniMite moto tool using Taranis' 3-D images as reference. The ventral cockpit housing of the Quad was also larger and wider than the part from the Thunderfighter post. It was shaped from a single, regular-sized popsicle stick sanded into shape with a drum sander and disc sander attachment on a moto tool. The completed part was glued to fit the notch of the bottom rear part of the airframe. Finally, the chevron-shape of the rear end was made using a 1/4" drum sander, cutting wheel and disc sander attachment on a MiniMite. With the availability of wooden dowels for the weapons/engine pods, I figured that a step for weapons/engine pods was unnecessary. I integrated all minor sub-assemblies into this final phase. The available wooden dowels were sanded using a coarse/fine drum sander in a Dremel 3000 to match the size and shape in the scaled plans. The fine drum sander was useful to carve the notches between the nozzle and the main engine pod. A #125 high speed cutter mounted on a MiniMite was used to drill the tiny holes for the engine exhaust. The delta wings were from a thin wooden coffee cup stirrer sliced diagonally and finished with a disc sander attached to Minimite. The auxiliary wings were cut from a regular-sized popsicle stick and sanded thinner with a disc sander attachment. A fine drum sander was used to slightly carve the ends of the auxiliary wings that will mount the tiny wing tips. The wing tips were carved from a toothpick and cut to the size illustrated in the plans. Each tip was glued to the slightly curved end of the auxiliary wing. Make sure to glue each tip as illustrated in the plan! I had to re-do this part when I made a mistake in gluing the wing tips pointing backwards. The weapons/engine pod assemblies were glued to the completed airframe using the attached plan as guide. I used spares to prop up the airframe while the glue on each weapon/engine pod assembly dries. The delta wings were mounted next. I used a "third hand" parts holder for the airframe while the glue between the delta wings and the weapon/engine pods dries. Finally the auxiliary wings were glued at an angle below the rear weapon/engine pod assemblies. Spares were used to hold the airframe in place while the glue settles. Tadahhh! A Quad (escorted by a pair of Thunderfighters!) ready to protect Earth from the Draconian Empire! Next up is a Snowspeeder from the Star Wars Series. Watch out for it! Excellent, most impressive work and thanks for including me in your build. its will be some time before I get back to the falcon. but there are others models available if you need some images. My Falcon is a basic study model with correct scales, that would be helpful. Awesome job. A great way to bring back a classic design. I must make one. I must have one. I remember always wanted one since I saw the series; pff. When I was small. About time someone made something "Buck" wise. As always, great work! These look great! On a side note, I really like the way you take your photos showing the tool(s) you used in that step.